I have several passions in life and one of those is craft beer. While my dad is more of an "MGD" kind of guy and my brother is satisfied to go through his entire life on Bud Light, I must have variety. Even while living in Germany where beer is cheaper than water and they make arguably the best pilsners, wheat beers, and bock beers, I found myself longing for some more variety. It was a slap in the face to be so close to Belgium, who's known for their endless varieties, and not be able to buy any of it in the stores. All of that to say that I love the craft beer scene and it is absolutely blowing up in the States and surprisingly in Asia. One of my dreams has been to start brewing my own beer, but I've always made excuses since living overseas that I need to wait until I have more space or a home with a dedicated room for brewing. That actually would've been true in Germany when our apartment was tiny, but now that we've had a substantial upgrade in our place in Hong Kong, my mental roadblocks were unfounded. We were initially shocked to find out that so many craft beers are available in bars, stores, and online shops in Hong Kong, which raised my spirits and got me thinking about trying out home brew here. Marisa found an online distributor (Beer Necessities) of Beercraft USA products such as starter kits and ingredient kits for different beers. After talking it up with a colleague and receiving enthusiastic support, I decided to purchase a starter kit and try my hand at home brew. You'd be surprised how many ingredients go into this puppy. Of course it really only takes four: water, malt, hops, and yeast, but this recipe had three types of malt and three types of hops. I like to try running before walking! Brew day mostly involved sanitizing equipment and then boiling a bunch of ingredients. As long as you have a huge pot then you're good to go. Here we have the first bag of grain steeping to start our beer soup. Then we're adding different types of malt to add to the sugar needed to make alcohol. You've got to boil this brew for nearly an hour, but it smells delightful. Vlada's favorite part was the addition of the bittering hops, flavoring hops, and aroma hops near towards the end of the brewing. This balances the sweet flavor with the bitter flavor characteristic of beer. A bit more malt is added here as Jonny enthusiastically stirs the pot. Once the brewing is complete - which took nearly two hours altogether - then you're supposed to cool it down as quickly as possible. This was where our biggest mistake/learning opportunity was made. If only there was a physics teacher on hand to suggest that we should cool off the liquid while it's still sitting in the pot, which happens to be a great thermal conductor! Unfortunately we didn't think it through and instead, dumped the steaming mixture directly into the insulating container. Little did we know, this mistake would cost us a lot of time! Adding more cold water to the wort helped to cool it down, but not enough. We probably should not have put as much water in at this point either, since it affected the alcohol content of our beer - as we would find out later. 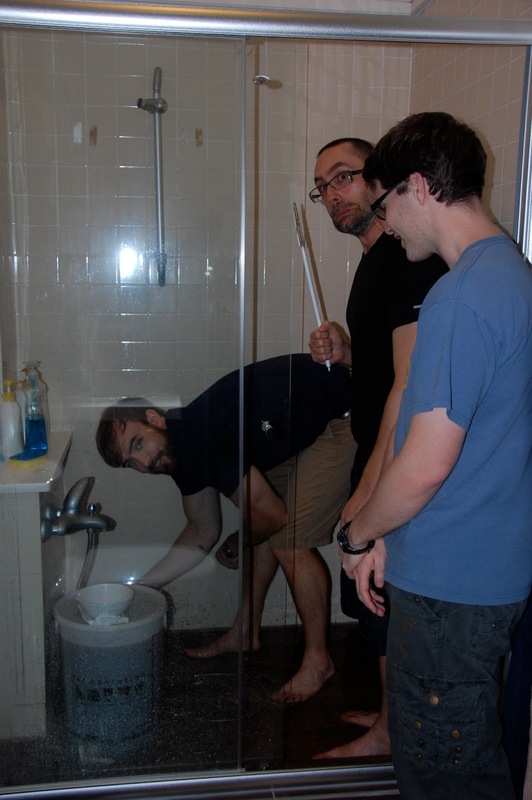 Once the cold water was added, we were just over 100 degrees Fahrenheit. Before we could add the yeast we needed it down to below 80 degrees - otherwise the yeast cells would be killed upon contact with the wort. ....then we decided to try an industrial-size sink to try to let it sit (in a garbage bag) in cold water - this was not how I envisioned my first brew day.......later we put the fermentation bucket out on the breezeway of our apartment and wrapped wet towels around it.......then we settled on just letting it sit in the apartment with the air conditioning cranked up. The hydrometer here was used to measure the specific gravity of the beer, which is basically a density measurement compared with pure water. 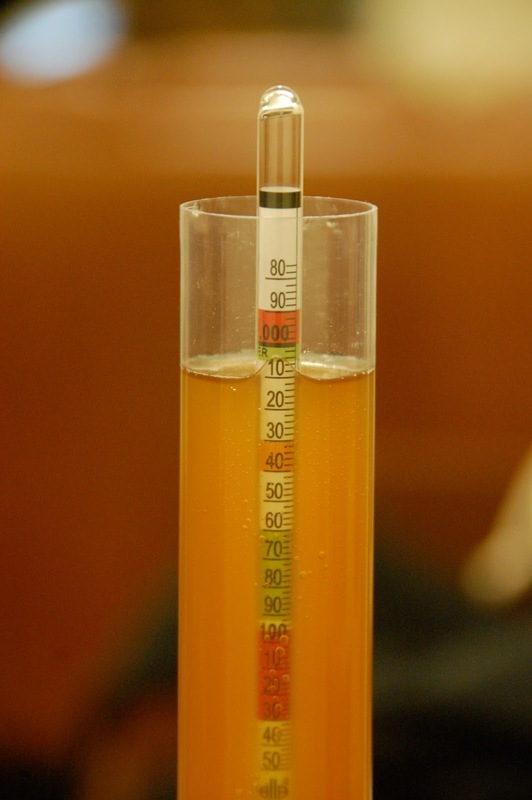 The only way to know how much alcohol the beer contains is to take a measurement of the wort before adding yeast, and then taking a second measurement after fermentation. 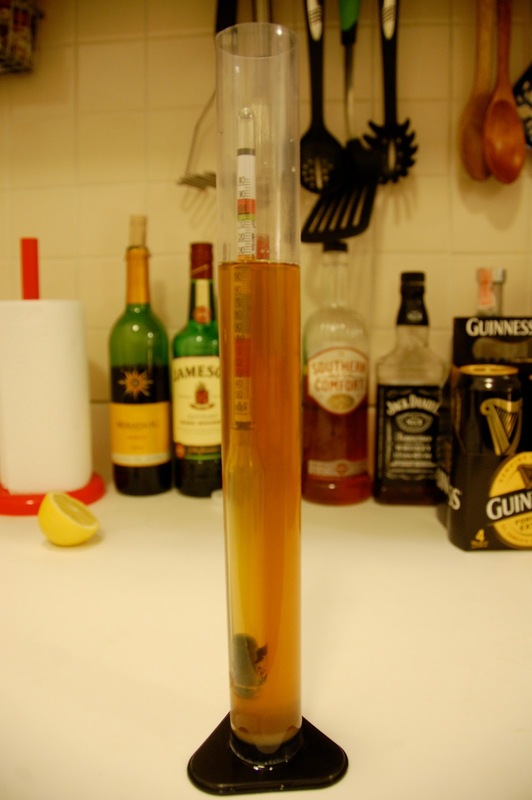 The difference in density tells you how what percentage was converted to alcohol. Brewing started at 6pm and I sat with the tank in a freezing room until the temperature dropped below 80 degrees at around 1am. At that point I added a packet of liquid yeast cells and sealed the container with an airlock (not pictured). 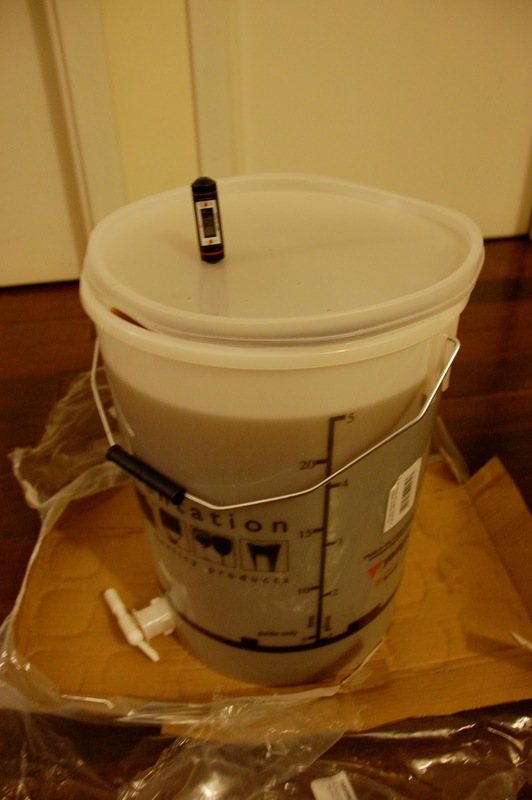 This bucket then sat in a darkened, cold guestroom for about three weeks to complete fermentation. Next comes the bottling day! In preparation for our release party I ordered some pint glasses and the goal that we're striving for - Rogue Dead Guy Ale. I was worried during fermentation that nothing was happening and that perhaps all of the yeast had died, but when I opened up the lid on the fermentation bucket all I smelled was sweet bliss! Whether there was alcohol or not, this stuff is going to taste great. All of our bottles were sanitized and we were ready to transfer the beer from the tank. 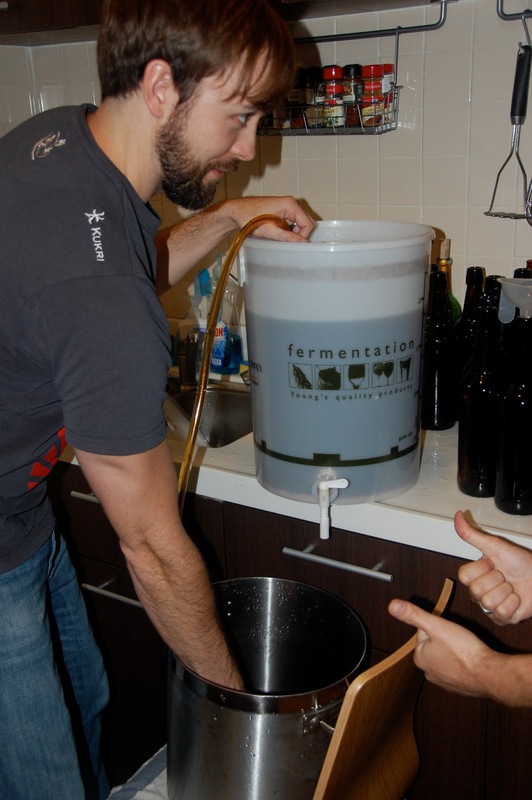 "A country boy can survive" and a country boy could step up to the plate and demonstrate a little siphoning technique to transfer the brew from the fermentation bucket to our pot. We had to do this to remove the sediment from our fermentation bucket before bottling since we didn't have a second bucket with a tap. 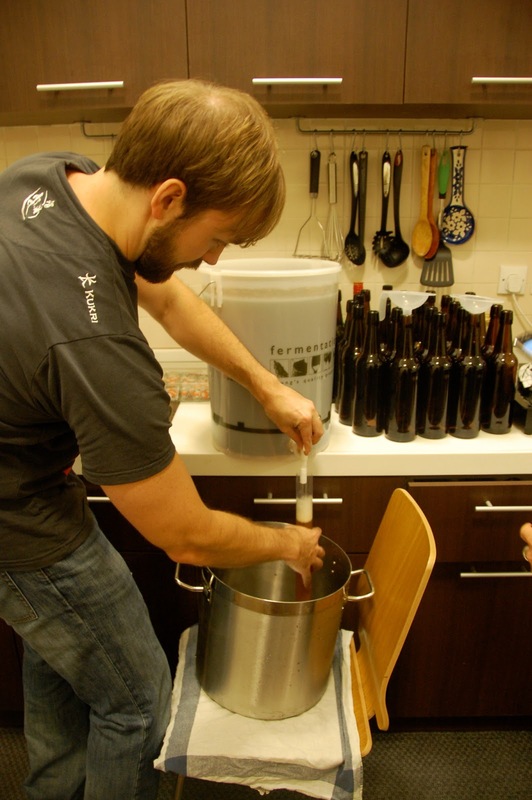 Once we transferred to the pot we cleaned out the fermentation tank and then transferred it back into the bucket. 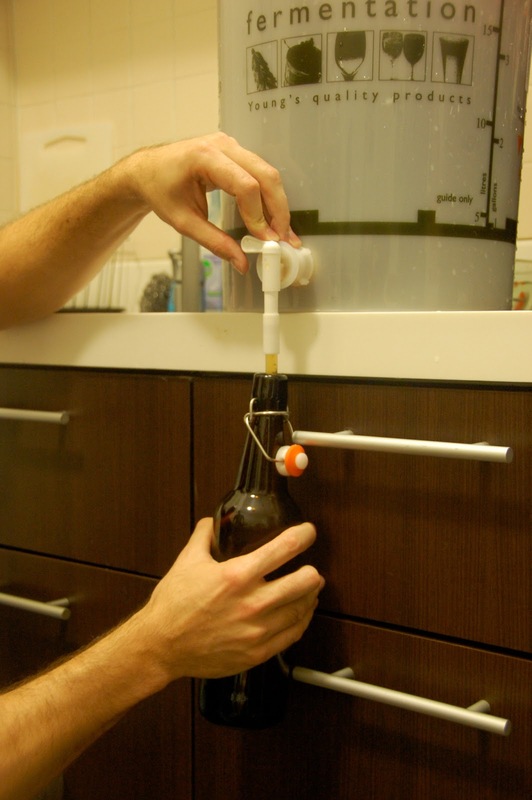 Now I'm filling the hydrometer to take a second specific gravity reading. Then we painstakingly inserted the caps onto our bottles to prepare for filling. Then the gratifying step of filling the bottles. In one batch we were able to fill 26 750-mL bottles. That's just under 20 liters of beer, so we were happy about that. The test of truth came with the final gravity reading, which turned out o.k. With my measurements, we're projected to have a beer with 3.6% alcohol. It's definitely lower than the original Dead Guy Ale, but you've got to start somewhere. The whole process has been very gratifying work and we're excited for our first batch release party in two weeks. Our beer needs a little more time for bottle conditioning and we don't want to rush things. Plans are already in the works to get the lager brewing in a couple of weeks, but since it needs much more time in the bottle, we might not be able to enjoy that one until we get back from summer vacation. Fisher Warren Jackson has arrived!